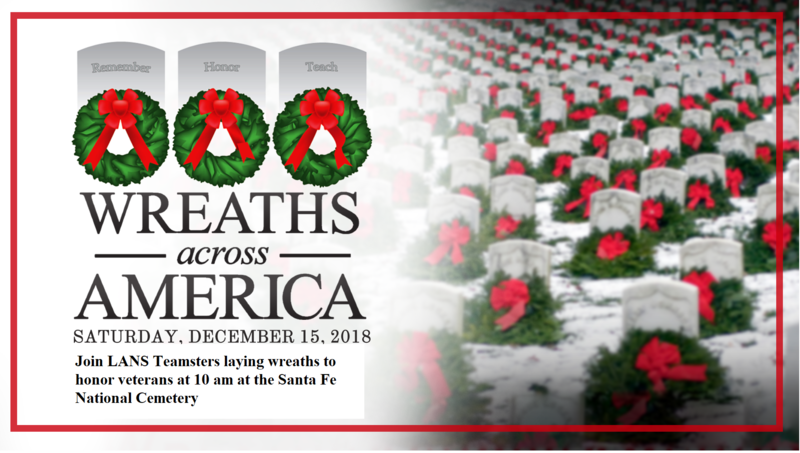 Come out and join Wreaths across America, LANL and Teamsters 492 in laying wreaths at the Santa Fe National Cemetery, a place of Honor for our veterans. If you would like to volunteer to come out and help, please notify Teamster Brother Ralph Martinez 505-221-3227 or Teamster Brother Jesse Marquez 505-412-2799. The Teamsters will be meeting at the coffee table in front of the Admin Bldg between 9:15 - 9:30 am. Dunkin Donuts has donated coffee and donuts for the Teamsters that come out. Click the "Sponsor Wreaths" button, choose the amount, then click the "Review My Sponsorships" button to complete the sponsorship.